Everything was going wrong this Christmas, and the dogs were too stupid to care. Usually, after the Feast of the Giant Bird, Shreddy and the dogs were given table scraps to eat. As a cat and a mediocre hunter, Shreddy relished the chance to taste the flesh of an avian larger than himself. He looked forward to it all year. Thus, he watched in utter horror as one of the Red-Haired Woman’s dinner guests scraped all the plates off into the trash. No taste of turkey this year. Despite this affront, the two dogs — Cooper the Labradoodle and Susie the Cavalier King Charles Spaniel — scuttled around the guests’ feet, wagging their tails and collecting pats on the head as if nothing was wrong. As if a pat on the head could make up for the loss of a toothsome bite of turkey. Then it got worse. Instead of bringing home a fresh, fragrant pine tree — perhaps a luscious Douglas Fir or a savory Blue Spruce — the Red-Haired Woman brought home a cardboard box with a picture of a tree on it. When she opened the box, the inside reeked of plastic and was filled with a horrible mockery of tasty foliage. Metal branches and plastic needles. Nothing worth chewing on. No! Seriously? This was not right! The Red-Haired Woman was supposed to get out the Noisy Box That Makes Popcorn. Then she was supposed to sit and thread the fluffy kernels with red globes of cranberries onto chains for hours while Shreddy tangled himself in them. She was supposed to throw kernels of popcorn at the dogs who would jump to catch them. Shreddy didn’t know why the dogs ate the things, since they tasted like packing peanuts, but Cooper always looked hilarious as he jumped around like a buffoon. Shreddy loved to watch Cooper look like a buffoon, and he loved to steal the fluffy kernels to bat them around the floor. Stealing from Susie was the best — she got these sad eyes and started whining. It always made Shreddy chuckle. No chuckles tonight. Just glowering out the window. The colorful little lights danced in the reflection on the window, but Shreddy stared past them into the darkness of the early December night. He could feel the cold of the night radiating through the window, and the chill made his back twitch, rippling the gray stripes of his fur. Shreddy was not a cat who enjoyed prowling through the cold, honing his hunting skills. However, when he noticed the sparkle of a tiny pair of eyes, staring up at him from a clump of frozen grass outside, Shreddy was struck with an idea. A small, helpless mouse would be the perfect target to help him vent his anger. Mice need to die. It’s good for them. And a good deed was exactly what an evening of such immense disappointments called for. It was the perfect way to get into the Christmas spirit. Shreddy hopped down from the window and ran for the pet door with his fat stomach wagging beneath him. Shreddy almost rethought his plan when the frigid nighttime air hit his whiskers, but the memory of those hopeful, sparkling eyes steeled him. That hope needed to be dashed. Mice should not hope. How dare a mouse hope, when Shreddy was sad? The mouse, weak from cold and hunger, merely stared at Shreddy and shivered. It didn’t even run. Pathetic. Shreddy wasted no time on teasing or taunting the mouse. That would have kept him out in the cold longer. The kill was quick and clean. Shreddy considered dragging the dead body back inside to leave under the abominable tree. But, so far this Christmas, the Red-Haired Woman didn’t deserve a present. Shreddy hurried back inside. Nevertheless, even in the warmth of the house, the cold stayed deep inside Shreddy’s fur. He shivered himself to sleep. Shreddy’s dreams were haunted by sparkling mouse eyes. They hung on the Christmas tree, replacing the colored lights. They looked at Shreddy from Cooper’s and Susie’s faces. Then Shreddy saw himself reflected in the window, and beady mouse eyes looked back at him from his own feline visage. That startled Shreddy awake. Shreddy almost felt happy when Cooper got his head stuck, but then the oaf of a Labradoodle got frustrated and started chewing on the couch. That’s when the Red-Haired Woman put a stop to Shreddy’s fun, deciding that the dogs needed a trip to the dog park. Dog park, Shreddy grumbled. Talk about privilege. If Shreddy ran things, dog parks would be more like parking lots than playgrounds: owners would take their dogs there and leave them. Then the Red-Haired Woman would take Shreddy to a cat park, filled with slithering vines — fun to play with like snakes, but tasty like orchids — and dust motes dancing in the warm, sunny air. Shreddy glared at the Christmas tree. It smelled unappetizing, but the twinkling lights were fun to watch. He let the lights’ dancing patterns mesmerize him, hypnotize him, and call him closer. His weighty girth shook the tree as he placed his paws on the bottom branch. The metal spokes that comprised the cores of the branches bent as he climbed them. Nestled comfortably near the top of the tree, Shreddy found a little of the Christmas spirit for the first time that season. He idly clawed at some of the ornaments, feeling a surge of fondness for their familiarity. 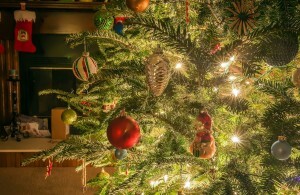 The ornaments were always the same: glass stars and icicles; crocheted snowflakes; and plastic figurines, including a dozen Santas in different poses; several reindeer; a mouse sleeping on a partially eaten sugar cookie; and a teddy bear angel on the top. There used to be little wicker creatures and origami polyhedrons, but Shreddy ate those years ago. The memory of the wicker ornaments made Shreddy’s mouth water. He felt like gnawing on something. Shreddy pondered the different ornaments surrounding him, but none of them were appetizing. That’s why they’d lasted so many years. Finally, Shreddy decided that, despite the wretched new plastic smell, the faux Christmas tree’s bushy needles would have to do. Besides, it wouldn’t really feel like Christmas to Shreddy if he didn’t get a good mouthful of decorated tree. As the bristly plastic needles filled Shreddy’s mouth, he felt a kind of contentment. At least, their texture was good. Then he chomped down. The moment Shreddy’s teeth hit the twisting wires wrapped tightly around the branch’s metal center, a shock bolted through his gums and all the twinkling lights went out. Back on. Out. And back on again. Shreddy’s fur fluffed out from ears to tail tip, and his heart pounded so fast he thought it would explode. His mouth tingled with the sting of electricity even after withdrawing his teeth, and he realized he was panting like a dumb dog. He couldn’t help it. At first, Shreddy was terrified. He wanted the Red-Haired Woman to come back and use her Magical Person Powers to make him feel better. However, as the minutes passed, Shreddy was grateful that no one — especially Cooper or Susie — had been there to see his sorry state. And he was furious with the Christmas tree for tricking him into electrocuting himself. Shreddy thought the ordeal was over. Then he saw the ghost. A translucent, rodential apparition with glittering, beady eyes hovered in the air, between the tree branches, in front of him. It was the mouse Shreddy had struck down the night before. The mouse whose eyes haunted his dreams. Shreddy blinked, and the ghost was gone. However, Shreddy soon noticed other disturbing changes to his senses. The Christmas ornaments were singing. The teddy bear angel was leading them in a rousing rendition of Jingle Bells — the Santas provided a solid chorus of altos; the three reindeer made for a catchy bass line; and the sleepy cookie mouse’s voice rose above the others in a soaring, squeaky soprano. Almost anyone who heard them would have been quite charmed. But not Shreddy. He was horrified, and his ears flattened tight against his head, trying to shut out the cheerful music. It made next to no difference. Either the shrill tones of happy Christmas singing pierced right through the thin layer of Shreddy’s ears or else he was imagining the sounds and couldn’t shut out his own hallucination. Shreddy got out of the Christmas tree as fast as he could, which involved half climbing and half falling down through the brushy limbs. He spent the next several days skulking under the Red-Haired Woman’s bed, as far from the Christmas tree as he could manage while staying in the warmth of the house. Even there, all was not well. The apparition of the mouse he’d slain continued to haunt Shreddy. Cold fingers tickled his back. Foul breezes like the breath of a mouse ruffled his whiskers and tormented his nose. He felt tugs on his tail, only to turn spitting and find no one there. And the soft squeak of a mouse’s laughter woke him from his cat naps. Harried and hassled, Shreddy sought refuge on the Red-Haired Woman’s lap. Instead of her Magical Person Powers protecting him, though, Shreddy brought the Curse of the Dead Mouse on her. She twitched and squirmed, disturbed by the same rodential poltergeist, making her into a terrible, unsteady lap. Worse, her discomfort disturbed Susie, and the little spaniel took to woofing her head off, trying to impersonate a guard dog. Then Cooper picked up the hue and cry, and went barking about the house, not even knowing what had started it all. Shreddy decided that was worse than the singing Christmas ornaments. Reluctantly, he returned to the mock-tree, hoping that the cheerful singing would keep the poltergeist away. Fight fire with fire. Fight hallucinations with other hallucinations. From his perch in the middle of the tree, Shreddy watched the ornaments dance around the branches. The tree had been a frenzy of ornamental activity since Shreddy had climbed back into it. The twelve Santas had set up a betting pool, and the three reindeer raced for them, flying round and round the tree. Several of the Santas had sacks of toys from which to lay their stakes, but the other Santas took part by betting fur-lined boots and red hats. It was the strangest thing Shreddy had ever seen. Shreddy watched with eyes dilated like a kitten high on catnip, wondering whether the Red-Haired Woman and the dogs could see the ornaments constantly rearranging themselves. Surely the Red-Haired Woman must notice that one of her Santa ornaments was wearing six hats while five others went hatless? At the behest of the tree-topping angel, who felt that gambling was beneath a man as eminent as Santa — especially twelve men as eminent as Santa — the Santas moved on to rehearsing an all-Santa performance of the musical CATS. The reindeer made costumes for the Santas out of the crocheted snowflake ornaments while the Santas practiced their songs. Shreddy had to redefine his idea of the strangest thing he’d ever seen. “Won’t you guys ever go back to being inanimate plastic?” Shreddy asked the ornaments. Shreddy had a very different idea of fun than the Santas seemed to. However, even he had to admit that the ornaments’ antics held a certain quality of fascination for him. Much more mesmerizing than they’d been before. And Shreddy had liked them before. That’s why he hadn’t batted them around and hidden them under the couch. Shreddy, the three reindeer, the cookie mouse, and the teddy bear angel watched raptly as the Santas’ rendition of CATS came together. No band of Santas could ever ask for a better audience. When their final performance came to a close, the cookie mouse crumbled the edge of her partially eaten sugar cookie and showered the performing Santas in a confetti of crumbs. The gesture was meant to be celebratory, though it proved in practice to be rather messy. Shreddy felt happier and more peaceful than he had since the whole debacle of the faux-tree had begun. He settled into his perch, spread across the nexus of several branches, and closed his eyes for a good, long catnap, surrounded by the Christmas cheer of the ornaments. Unfortunately, nearly as soon as Shreddy closed his eyes, the squeaking laughter of the mouse poltergeist began. All the Christmas ornaments turned their eyes to him. “What’s wrong?” asked the cookie mouse. At the word ghost, the whole tree shook and shivered. The colored lights flashed on and off. And the temperature of the room dropped. Shreddy felt a powerful loneliness. A sense of isolation crept over him and consumed him. It was as if he’d never belonged to the Red-Haired Woman. As if he’d been a feral cat, wandering the streets alone and sleeping outside, his whole life. He felt like a kitten again, small and shivering. The feeling took him deep inside himself — before the despair of being shut behind the bars in the animal shelter where the Red-Haired-Woman found him — all the way back to his first few weeks of life as a stray. Shreddy felt a sensation of vertigo and nearly fell out of the tree. The feeling passed, but it left his fur twitching all over. He realized he was growling, high in his throat, and the pitch of his voice rose into a snarling hiss. “What happened?” one of the hatless Santas asked. All of the Christmas ornaments looked shaken, nearly as upset as Shreddy. “It felt like there had never been Christmas…” the cookie mouse said. The Christmas ornaments shuffled uncomfortably, hanging from their branches. Clearly, they’d all shared the same, disturbing sensation. “It’s haunting me,” Shreddy meowed miserably. In a meow so small it was barely a mew, Shreddy said, “I killed it.” His ears were still flattened, and he could still feel tingles in his whiskers. The cookie mouse glared at Shreddy. “Why did you kill it?” she said. Shreddy blinked. Such a strange question: obviously mice need killing. “I was trying to get into the Christmas spirit?” Shreddy said. That should be something a Christmas ornament would understand. Even a Christmas ornament shaped like a mouse. The cookie mouse harrumphed at Shreddy. Clearly she felt more of a kinship with the mouse poltergeist — despite it being real and evil as opposed to good and imaginary — than Shreddy would expect. She pointedly turned her back to him, grumbling that he wouldn’t get any more crumbs from her sugar cookie. Fortunately, Shreddy didn’t have a lot of use for hallucinated crumbs of a plastic cookie. Of course, the raised fur along his spine and bushed out tail only helped prove Six-Hatted Santa’s point. Shreddy did look like he belonged more in a haunted house than a manger scene. A Christmas tree haunted by living ornaments? That was more of a tough call. Shreddy considered unleashing his wrath and unsheathing his claws on the ornaments. A Christmas rampage. But that would have taken energy, and all of his cat naps of late had been interrupted by ghostly squeaking. Instead, Shreddy slunk down through the faux-branches, planning to let out his suffering by yowling at the Red-Haired Woman until she felt as frazzled as he did. As he reached the base of the tree, though, Shreddy heard the voice of one of the reindeer ornaments calling to him. With flattened ears, Shreddy looked back to see what the reindeer wanted. It was climbing down the tree after him. Shreddy blinked. And the reindeer was gone. For a moment, he thought his hallucinations were over, then he heard the sounds of the Broadway musical “Camelot” from the branches above. The reindeer ornament must have simply scampered back up to his fellows. Still, it was an interesting idea the reindeer presented: what did the ghost want? Shreddy had assumed the ghost wanted merely to torture him. But, if the ghost wanted something else, like a piece of cheese — mice like cheese, so dead mice probably do too, right? — then maybe Shreddy could fix this situation. And the mouse would go away. This presented Shreddy with a new problem. He needed a piece of cheese, and the Red-Haired Woman kept the cheese in the Giant Sealed White Box of Coldness. There was no way into that box. Shreddy had tried to claw his way into it before. However, Cooper did have a plastic, squeaky toy cheese. Poltergeists can’t eat anyway, right? So, what difference would it make to the mouse poltergeist if the cheese was real or not? Shreddy spent the rest of the day peering from around corners at Cooper. The empty headed Labradoodle was snuffling around the edges of rooms, occasionally licking the walls. He seemed occupied with his strange pastime. But Shreddy knew from past experience that Cooper had an uncanny ability to sense when a feline was stealthily approaching his dog bed filled with smelly rawhide and ridiculous squeaky toys. So, Shreddy waited patiently until Cooper flopped onto his side and passed out on the middle of the floor. He fell into a snory dog nap with his paws waving fitfully in the air. Shreddy made his move on the cheese. Shreddy had to suffer the indignity of a withering look from Susie for stealing the toy, but she didn’t bother to defend it. Squeaky toys sounded too much like they were shrieking in pain to her when she chewed on them, and she wouldn’t risk hurting the innocent cheese herself just to rescue it from Shreddy. Alone with the cheese, Shreddy tried several magical incantations to summon the rodential poltergeist to him. Of course, he didn’t really know any magical incantations, so he mostly muttered under his whiskers, threatening the dead mouse with further deaths for itself and its living relatives (not that he really wanted to go to the trouble of hunting more mice) if it didn’t reveal itself, accept the offering of cheese, and get out of his life. The mouse poltergeist did not heed Shreddy’s words. It did not appear before him. In a moment of lucidity, Shreddy pictured himself muttering over a squeaky cheese, at the advice of a reindeer ornament, and thought perhaps he’d lost his mind. He’d imagined it all. There were no singing Christmas ornaments. And there was no mouse poltergeist. Then the maniacal squeaking began, and a wind that smelled of rot and rain blasted his whiskers, causing Shreddy to flatten his ears. “I don’t want cheese!” The words squealed like claws scrabbling over steaming ice. More than words, Shreddy felt a summoning inside himself: Come to the place you struck me; come to the place you killed me with your paw. Shreddy wasn’t a fan of the winter air at the best of times. At night, under the summons of a hostile ghost? It was all Shreddy could do to slink, fat stomach dragging on the ground, and tail tucked between his legs like a dog, out the pet door and into the yard. He left the squeaky cheese behind. Shreddy expected winds and squeaking as loud as thunder. Instead, a small ghostly figure appeared quietly on the snow in front of him. It was the mouse he’d killed, still shivering, but transparent. Shreddy’s ears perked up, and he tilted his head. The poltergeist wasn’t so frightening here. On an impulse, Shreddy reached out a clawful paw and swatted the vision, but his paw passed right through the mouse and struck the ground beneath. “Well, that’s true,” Shreddy said. Although, he couldn’t help thinking that if the Red-Haired Woman really loved him, she would have given him a plate of turkey and a real Christmas tree to chew on instead of causing all this trouble. Maybe if the mouse could just see how disappointing Shreddy’s life truly was, it would let go and move on. “I can try,” the mouse squeaked. The mouse’s ghostly eyes narrowed, and its whiskers quivered in great concentration. Shreddy felt a tingling in his whiskers and ear tips, but the ghost didn’t seem to be strong enough to possess Shreddy without a little cooperation. Shreddy pitied the ghost. He closed his cat’s eyes, relaxed the tension in his ears and tail, and opened his mind. When Shreddy opened his eyes again, both Shreddy and the mouse looked out through them. The mouse’s name was Whisperquick, and she’d lived in the yard of the Red-Haired Woman’s house for the entire year and a half of her short life. Through their melded selves, Shreddy remembered the experience of mouse teeth nibbling on soggy popcorn and cranberry chains. The chains had dangled off the discarded Christmas tree last January, as it lay skewed and needleless on the edge of the street. For Whisperquick, it had been a glorious New Year’s feast. For Shreddy, it had been a relic, thrown away with the trash. Shreddy felt Whisperquick wondering whether there would have been more popcorn chains to look forward to if she’d lived, and his ill-tempered emotions instantly answered her question. Their minds were too close for true conversation. Whisperquick’s thoughts felt small and weak compared to Shreddy’s, and he was confident he could push her out from his mind and body if he needed to. But, he was committed to seeing this to the end. He would show this mouse how little she was missing, and then she’d give up the ghost and be done haunting him for good. With Shreddy’s guidance to remember the way, Whisperquick walked her new feline body back to the pet door and inside of the house. It was nearly midnight. And, Shreddy realized when he saw the kitchen table with cookies and milk set out for Santa, that tonight was Christmas Eve. Whisperquick thrilled with excitement when she realized her one day as a pet would, in fact, be Christmas Day. Shreddy couldn’t help sharing her excitement — her mind was too close to his for him to avoid it. Despite Whisperquick’s eager anticipation, she was saddled with a feline body in need of sleep. So Shreddy guided her to the Red-Haired Woman’s bed where they curled up on the warm, cozy blankets next to the bump of her feet. Neither cats nor mice dream of sugarplums. But Whisperquick’s dreams, sifting through all the happy memories in Shreddy’s head, were sweet. They awoke the next morning in an addled daze — Shreddy wasn’t used to his memories focusing so thoroughly on the good in his life, and Whisperquick wasn’t used to waking up somewhere warm. The Red-Haired Woman petted Shreddy, scritching behind his ears and cooing “Good morning” and “Happy Christmas” sounds at him and the dogs. Whisperquick was so startled by a human hand reaching for her that if she weren’t already a ghost, she would very likely have died from fright. But, soon, she was purring and enjoying the caresses as if she’d been a cat and a house pet all her life. The traditional Christmas breakfast of scrambled eggs for the pets confused Whisperquick at first. To her mouse’s sensibilities, the dogs’ bowls on the floor — with smears of peanut butter on the eggs — smelled more appealing. But Shreddy’s bowl of eggs was served on the counter with cream poured over it. Fortunately, the cat’s body that Whisperquick inhabited was made for loving eggs and cream. Next came the present. The Red-Haired Woman always had new toys for them all. Cooper got a strange star-like object made from the same material as tennis balls. It bounced in wacky ways when the Red-Haired Woman threw it for him. Susie got a bright red plastic cube with balls hidden inside. It was a puzzle, and Susie immediately took to knocking it around the floor with her muzzle, trying to dislodge the balls. Shreddy’s present was a new Koosh ball that dangled from a stick. Cooper had eaten the last one, and Shreddy missed it sorely. He suspected this one wouldn’t last long either. Although, it was hard to feel cynical while Whisperquick stared out through his eyes in amazement at every pedestrian detail of his life. When the furnace roared to life, heating the room, Shreddy’s feline body automatically stretched luxuriously in reaction. Shreddy took the warmth for granted; Whisperquick thought it was yet another generous Christmas gift from the Red-Haired Woman. When the Red-Haired Woman invited Shreddy and the dogs to snuggle with her while she watched Miracle on 34th Street, Shreddy wanted to turn his nose up at her. He didn’t like sharing her lap with clumsy, crowding dogs. Whisperquick, however, eagerly jumped into her lap. Worse, Whisperquick cuddled up against Susie and gently bumped noses with Cooper. Shreddy almost cast the pathetic mouse ghost out of his body right then and there. But he didn’t want her to haunt him again. And, strangely, the dogs weren’t so bad to share a couch with once they settled down into watching the movie. Nothing remarkable happened that Christmas evening. And, yet, everything was remarkable to Whisperquick. Every scritch from the Red-Haired Woman. Every soft cushion to sleep on. Every bite of food from Shreddy’s normal, boring old bowl of dry cat food. By midnight, Shreddy was exhausted from the constant feeling of joy and gratitude that Whisperquick radiated throughout his whole body, from paw pads to the tips of his ears and twitching tail. Perhaps Whisperquick was exhausted too. For she gave up Shreddy’s body without so much as a squeak of resistance. He didn’t even have to ask. One moment, she was purring on the couch, watching the Christmas ornaments dance in the fake tree. The next moment, Shreddy felt a hollowness in the pit of his chest, and he saw the translucent shape of Whisperquick’s mouse body crouched in front of him. “You’re ready to go now?” Shreddy asked, his voice still thick with all the purring Whisperquick had been doing. “Er, yes, well,” Shreddy equivocated. He didn’t believe in expressing gratitude, and he didn’t know how to gracefully handle someone expressing it to him. “You’re going to go away now?” he meowed hopefully. Shreddy led Whisperquick over to the Christmas tree. The ornaments were arguing about whose turn it was to be the tree-topper, but an observant Santa noticed that Shreddy had returned. “Oh look, the Halloween cat is back,” the observant Santa called out. Then, in the distraction that followed, the observant Santa scrambled for the top of the tree, successfully shouldering aside two other Santas and the reindeer who had previously been closest to the top. The teddy bear angel glared up at the Santa, tut-tutting about the use of questionable tactics. The Cookie Mouse glared at Shreddy, as if no time had passed since Shreddy’s confession of mousicide. All in all, it was a lot of glaring going on for the insides of a Christmas tree. The Cookie Mouse didn’t stop glaring, but her large round ears twitched with interest. “Want a crumb?” the Cookie Mouse asked, breaking off a piece of plastic that looked golden-buttery and delicious. Shreddy wasn’t sure how the cookie was able to keep providing crumbs without seeming to diminish in size. Perhaps one shouldn’t think too hard about the logic of hallucinations. Shreddy had to admit to himself that the thought had crossed his mind. He chose not to admit it to the Cookie Mouse though. “I think,” said the Santa at the top of the tree, “that we can do a little better than that…” He began climbing down from the top of the tree, and, when he got down to the level of Whisperquick and the Cookie Mouse, he un-slung the brown sack hanging over his back. He opened the sack and with much bravado pulled forth a plush mouse doll. Well, a plastic-ornament model of a plush mouse doll. Shreddy was getting confused by the rules of this hallucination, but the Cookie Mouse and Whisperquick squeaked with joy. “Perfect!” the Cookie Mouse said. Whisperquick didn’t say anything, but her ghostly presence lost its mouse-shape, becoming an amorphous, shimmery cloud that descended into the mouse doll. The mouse doll, newly animated by Whisperquick, opened her previously inanimate eyes. After a few moments to orient herself, Whisperquick scurried out of Santa’s hands and over to join the Cookie Mouse on her sugar cookie. The two mice danced. The Santas applauded. And the reindeer sang a spontaneous round of “Joy to the World” in three-part harmony. Afterward, the teddy bear angel officially welcomed Whisperquick to their fold with a moving speech. Whisperquick bowed her head in thanks, but she was too busy eating sugar cookie to say anything. Shreddy spent the next week watching the antics on the Christmas tree from a safe distance. Namely, the couch. He was hoping that the effect of his shock would wear off, and eventually the ornaments would go back to being inanimate. So far no luck. In fact, he was beginning to wonder if it would ever happen. He even wondered if the shock hadn’t so much caused a massive, complex hallucination as it had simply dropped the scales from his eyes. Had the Christmas ornaments always been alive like this? Only, until his shock, Shreddy hadn’t been able to see…? Shreddy was torn between annoyance and feeling flattered. In the end, his ego won, and Shreddy gave a blow by blow account of the Christmas ornaments’ games to his rapt audience of two dogs. He had to admit, he rather liked having them hang on his every word. On New Year’s Eve, when the Red-Haired Woman brought out the special shoebox to pack away the Christmas ornaments, Cooper and Susie howled pitifully to see them go. They wanted more stories! Shreddy, however, was relieved. He was ready to be done with the holidays and get back to normal life. Though, he kind of hoped that when next year came, the Christmas ornaments would still be alive. Previous Previous post: Last Week of Furry Book Month!